For a sector that finds itself so fairly and squarely in the sights of reviewers (and review sites), many in the restaurant industry has been surprisingly slow to formulate effective solutions. Here we outline our own solution, but first let's examine two examples - one a restaurant in Rome, another closer to home in London. 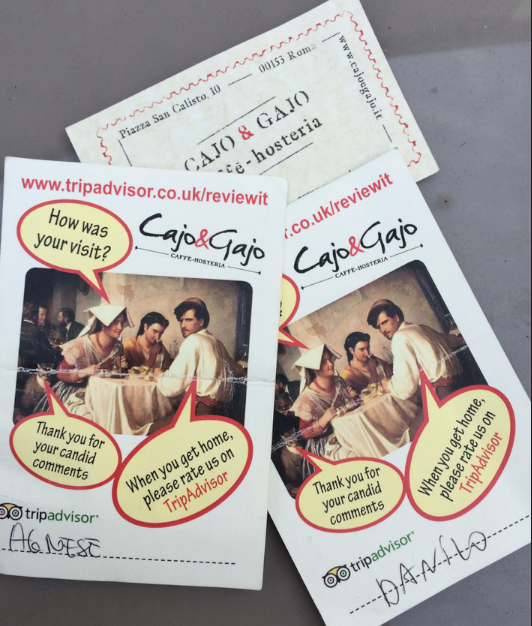 The first (small card) came with the bill, the second was handed by the waitress in person ('Agnese') and the third was handed by the assistant manager ('Danilo') on departure. When quizzed as to the restaurant's policy Danilo happily explained that "tucked away in a back street, away from the main tourist route, the restaurant's owners decided that they needed to adopt a very proactive policy to get reviews to TripAdvisor, we even get individually rewarded when someone mentions us by name." Has it worked? Well, they're ranked in the top 5% of all Rome's nearly 9,000 restaurants. What is even more unusual is that they have achieved this in less than nine months. By inviting reviews; they have 689 reviews, all but 82 of which rate them as 'excellent' or 'very good'. As a result the restaurant was packed on a Monday lunchtime in January. This (in our directors' opinions) great restaurant has been open slightly longer (end 2013), and has a great pedigree. The food and service are as close to impeccable as can be. yet the restaurant is not always full - even on a Friday night. They are ranked in the mid-4000's. In just over a year they have been reviewed just fifty-one times, and sixteen (30%) of those reviews rank the restaurant 'average', 'poor' or 'terrible'. Is to refine the Cajo & Gago solution. For two reasons: the first is that a fine dining establishment might reasonably say that bombarding their clients with requests to review, in-restaurant, does not sit well with their ethos. The second is that there is a better way. Hand each diner a card and a pencil at the same time as presenting the bill. Explain that they may like to let the restaurant have their email address. If they do (and there's no pressure) they will be sent useful information (changes of menu, offers for regular clients - not 'marketing'). The card itself will make clear that 'your email address will not be shared with anyone'. The next day an email will be sent, welcoming the diner to the restaurant's newsletter and inviting them to post a review of the previous day's experience on the restaurant's own website. A percentage of diners will respond. HelpHound will post all the positive reviews to the restaurant's website (for future diners to see). Any reviews containing issues will first be sent to the restaurant to resolve. HelpHound will then invite the reviewers to copy their reviews to TripAdvisor (or Google). The results will be immediate and sustained. And, as a bonus, the restaurant will be building a great database of diners for its other marketing.